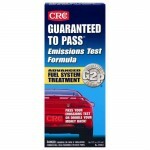 What is the Best Catalytic Converter Cleaner? After reviewing all of the top catalytic converter cleaners on the market we were faced with the tough task of recommending just one to our readers. To tackle this mission we first narrowed down the selection to the top 3 cleaners based on customer reviews. These included Cataclean Cleaning Treatment, CRC Guaranteed to Pass Formula, and Solder-it Cleaner and Deodorizer. Our thorough tests revealed just one true winner. If you want to fix your check engine light problems, there’s only one catalytic converter cleaner you can trust: Cataclean Engine and Catalytic Converter Cleaning Treatment. Cataclean is 50 state legal and complies with VOC (including California) and OTC regulations, as well as Federal low sulfur content requirements for use in diesel motor vehicles and non-road engines. For optimum performance and protection, use catalytic converter cleaner four times a year. 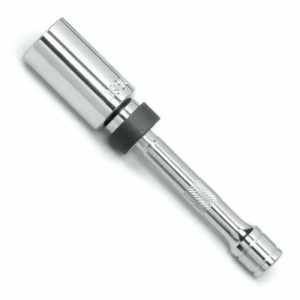 Use of this fluid is compatible with both pellet and honeycomb style converters. It is also safe for gasoline, diesel, hybrid and flex-fuel vehicles. 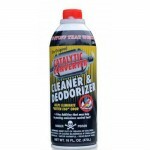 Catalytic converter cleaner is sold in 16-ounce cans with one primary way to use it. The best way to clean your converter is to pour the contents into your gas tank and drive until close to empty to ensure this chemical has been well used up. Pass emissions with flying colors! What is the catalytic converter and why is there a product to clean it? Under normal operation, your car engine produces harmful pollutants during combustion. Simply put, it is the catalytic converter’s job to convert these pollutants into a gas that is less harmful to the environment. This is achieved through a chemical reaction between the exhaust gases contacting the metals inside the catalytic converter. If your vehicle is not running properly and is using more fuel than usual (running rich), the unburned fuel will damage the catalytic converter and in some cases create a rotten egg smell. This is what a cleaner aims to eliminate, along with the general cleaning of the components it comes in contact with. What Causes Catalytic Converter Problems? Overtime your catalytic converter can become clogged with carbon buildup – this is one of the most common catalytic converters problems we see on a regular basis. This buildup on the inside of the catalytic converter prevents the catalyst from removing the harmful emissions from the exhaust. When the catalytic converter’s performance begins to suffer, the on-board diagnostic system (OBD2) in your car will let you know by turning on the “Service Engine Soon” light. Often times the warning light will be include a special code such as P0420 or P0430 which indicates that the catalytic converter’s performance is below the minimum emission threshold. So, what causes all of this carbon buildup? Excessive carbon buildup within your catalytic converter is a possible sign that your car is running rich. “Running rich” means the air-fuel ratio is less than optimal and your engine is not burning all of the fuel it is using. While there are many reasons that could cause your car to run rich, one of the first steps you should take is to replace your spark plugs. If you can’t remember the last time you changed your spark plugs, then this should be at the top of your to-do list. Check your owners manual to verify which style of spark plugs your car or truck needs. You can also use the fitment tool on Amazon to find the correct spark plugs for your car. Car engines typically have 4, 6 or 8 cylinders – that means you will need to purchase the correct number of spark plugs for your engine. Spark plugs are sold individually so you will need to check your owners manual to determine how many spark plugs you need. After you replace your spark plugs, the next step is to use a bottle of catalytic converter cleaner to remove the harmful carbon build up inside your exhaust. Does Catalytic Converter Cleaner Work? Catalytic converter cleaner removes the carbon build up in your engine and exhaust system. So, the answer is, yes, catalytic converter cleaner works every time you use it to break down carbon deposits. Will it remove over a decade worth of carbon build up the first time you use it? Probably not. That’s why products such as Cataclean should be used 4 times per year. Using it regularly will help clear out those stubborn deposits and prevent new carbon build up from forming. 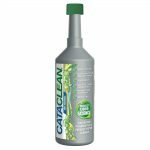 If you’ve read any reviews online of the products we recommended, you may encounter several people that have felt scammed by buying a bottle of catalyic converter cleaner. While this is unfortunate, you should be warned that you may need to buy more than one bottle of cleaner to get the results you are looking for. Yes, buying several bottles of cleaner can be expensive. However, it is much cheaper than buying a new catalytic coverter, which can cost hundreds of dollars – not including the cost of labor to install it! These are the magic ingredients that clean the inside of the catalytic converter. 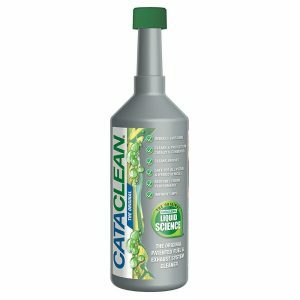 In addition to cleaning the exhaust system, a bottle of Cataclean will also clean your fuel injectors, remove deposits within the cylinders and improve fuel economy. So we’ve finally solved the mystery: catalytic converter cleaner actually works! However, in this article we identified a few reasons why you may be having catalytic converter problems to begin with. First, consider replacing your spark plugs if your car has over 50,000 miles. 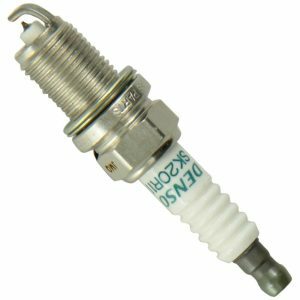 Damaged or worn spark plugs could be causing your engine to run rich which results in excessive carbon build up. Next, use a bottle of catalytic converter cleaner to remove the carbon build up from your exhaust system. If the first bottle of cleaner does not give you the results you are looking for, try it again. It could take several attempts to remove carbon build up in your exhaust system. Finally, after you have tried the suggestions about and you are still getting OBD2 error codes such as P0420 or P0430, you may need to replace your catalytic coverter. The precious metal inside the converter can be damaged easily and may not be repairable. In that case, take a look at our guide that covers catalytic converter costs and where to purchase a replacement.